Understanding what customers want is neither easy nor obvious — but it is essential for all companies. In this guide, expert Laura Reese walks you through the pitfalls and possibilities of customer interactions. Focusing on business-to-business fields, she demonstrates how to run face-to-face meetings that solicit valuable feedback and shares simple techniques for unlocking meaningful insights into a client's needs. You will learn how to cultivate an aligning mind-set within your company and among your own team by defining clear roles for each member. In addition to step-by-step guides for running customer alignment meetings, the book outlines specific skills for improving engagement with customers. Based on concepts of proven effectiveness, these tools will help transform a disparate group into a unified team of professionals working toward the same goal of discovering valuable customer insights. 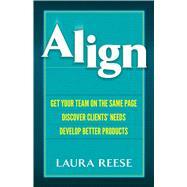 Laura Reese was a Project Planning Mangager at Altera Corporation from 1996 to 2004. In that capacity she developed the protocol for the Altera Customer Advisory Board, whose meetings were used to align roadmaps between the firm's business development and their clients. Currently, she is retired and lives in Italy with her husband and son.